The Golden Oldie Floats is 322.7 KB. Larger files take longer to load. This is the Golden Oldie Floats listing page, here you can download the plan, article and see the main thumbnail and extra images. Golden Oldie Floats. 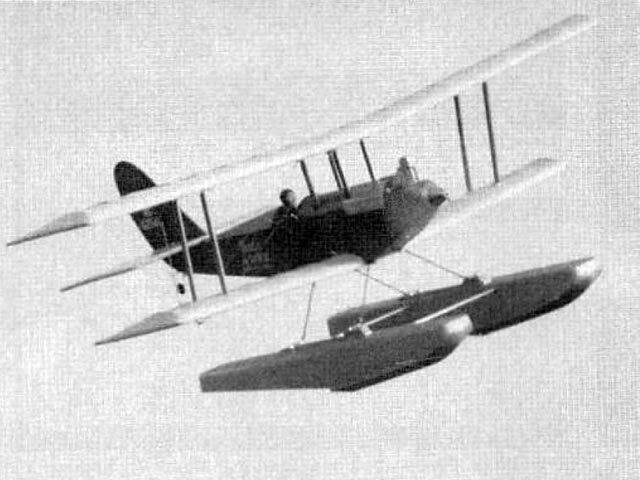 A Float Design For 5-8 Pound Aircraft, by Fred Reese. Last month we featured Fred Reese's Golden Oldie vintage type sport biplane for .40-.45 four cycle engines. It flew so well, he added floats. 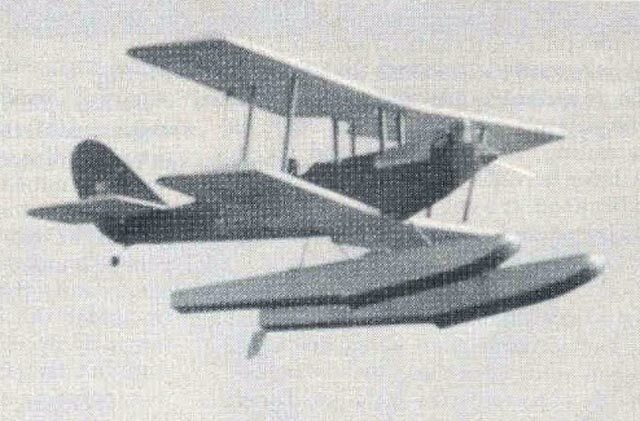 These floats will also work well on other .40-.60 powered aircraft weighing up to eight pounds. For three years I have been building and flying off of water with a variety of aircraft and float designs. With each new design I learn something new because some new problems occur. One by one the problems would be corrected to make the floats work. During this time I have read and studied everything I could find on float design for both full scale and models. My latest effort is the Golden Oldie, a 56 in vintage type sport biplane using an O.S. FS 40 four cycle engine for power. I had decided that if the Golden Oldie flew as I expected, I would build a set of floats, The airplane flew as well as I hoped, even better. I quickly drew up a set of floats and built them. I called my friend Don Harris at Lake of the Pines and we arranged to fly that weekend. We taxied the Golden Oldie around for a few minutes to check out the water rudder which turned out to be very effective. I decided it was time to try a take-off and at that point my real education on floats began. What followed was a very long, high speed taxi run. After about a quarter of a mile, the Golden Oldie did lift-off with a lot of elevator coaxing, and after what seemed like an eternity of fancy stick wiggling, it was flying. It was certainly not overpowered, but we both flew it, taking turns, and even managed some loops and rolls. We both liked it, but something had to be done about that take-off. First, the model was not tracking straight on the water. This required a lot of rudder correction during the take-off. An inspection showed that the floats were not mounted straight. I had anticipated this problem and the mounting method shown on the plan allows for some adjustment. After some adjusting and taxiing, followed by more adjusting and taxiing, we got the model taxiing straight and the take-off's were much easier and a little shorter. Later that day I flipped the model over on the water and got everything wet, so we quit for the day. If you get your four cycle engine wet, be sure to run it afterward at full throttle for about ten minutes to get all of the water out of the crankcase and valve train. Otherwise, remove the backplate and any other covers and warm in an oven until dry and then oil everything. That night, at home, I checked the float angle relative to the wings. On paper, I had designed the top of the floats to be at 0° relative to the bottom wing, I should qualify for Ken Willard's dum-dum award for following my own plans, as the floats were at least 2° positive, relative to the wing. The engine could not generate enough speed to overcome the extreme amount of rotation necessary to get the wings to flying attitude. A quick cure of the problem was to slip a 3/8 in spacer between each float and the struts. With the floats now at the proper angle, the Golden Oldie would take-off in about three hundred feet. I wasn't completely happy yet, but it was flying and taking-off consistently. Still, the model was sensitive to rudder corrections during take-off and several times while making a second take-off during a flight, the model would be unstable at lift-off. 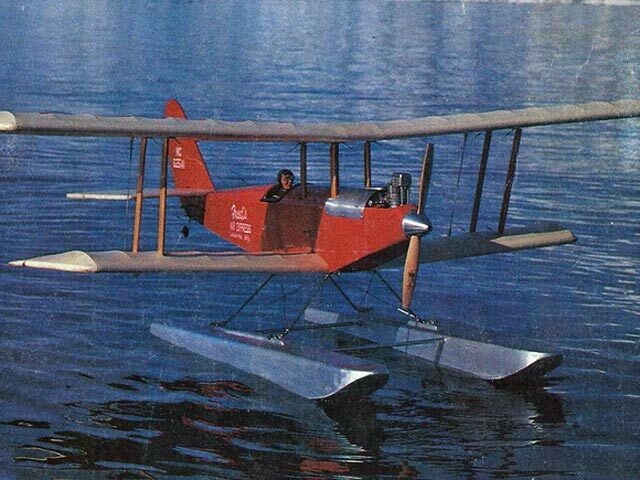 When I dumped the biplane in the water a couple of times, Don laughed at my fumble-thumbs until it happened to him. The airplane was acting tail heavy, but that seemed improbable to me as the Golden Oldie on wheels was slightly nose heavy and very stable. I hadn't rechecked the CG location on floats relative to the wheeled CG position. It then occurred to me that the wheeled landing gear weighs thirteen ounces and is positioned several inches ahead of the CG. The floats are only slightly heavier forward of the step and do not compensate for the heavier wheels. I screwed some weights to the nose of each float and the stability problem was cured. Before, with a full tank of fuel, the CG was far enough forward for the model to be stable, but later as some of the fuel burned off, the CG shifted rearward and the stability became marginal. With the model properly balanced it is a real pleasure to fly, but I still felt the take-off run could be improved. During one of our flying sessions at the lake, Eut Tileston visited us. Eut has designed full scale seaplanes and his R/C floats are excellent, so I listened to his suggestions. He told me that the rudder sensitivity during take-off would be helped by moving the float step rearward a little. Now I realized that a re-design of my floats was necessary. I wanted to change the angle of the forward keel so that the float bottom just ahead of the step would also be at 0° relative to the wing. I felt that the new float bottom would cause less drag on the water. Every little bit of drag is critical on a low powered float plane. Thrust must overcome drag to reach flight speed, the more drag, the longer the take-off run. Most R/C models have the extra power to quickly reach flight speed, so float design becomes less critical with increased power. The step was moved back 1-1/4 in to reduce the steering sensitivity. I also increased the angle of the rear portion of the floats and deepened the step for easier rotation at lift-off. Three-quarter ounce weights were glued into the nose of each float to adjust the CG. We tried several different propellers, but an 11/6 Zinger seemed to work best. The result of the changes is that the Golden Oldie will now take-off in less than one hundred feet. This has been a very interesting learning experience for me and I am very satisfied with the results. Construction. Cut out the bulkheads from light 1/8 x 3 in balsa. I made a little miter box from 1/4 in square balsa and a scrap piece of plywood. All of the bulkhead side angle cuts and bottom angle cuts are the same. The miter box simplifies cutting out the bulkheads and makes the parts more accurate. Lay the 1/4 x 3 in balsa top over the plan and mark the centerline and the bulkhead locations. Glue the bulkheads to the top. Cut out the 1/8 balsa sides and bevel the top edge and glue to the bulkheads and top. The sides will have to be pulled in at the front and the top pulled down slightly to meet the sides at the front. My original floats are not pulled in at the front and they do not look as nice as the plan floats. These are the details for the "Golden Oldie Floats" plan. If you would like to become a plan editor and help us to edit the attributes of all the plans in the website please click the "Edit Attributes" button below. Order your Golden Oldie Floats prints today! The Golden Oldie Floats plan can be printed on plain paper, tracing paper or polyester film and shipped worldwide. 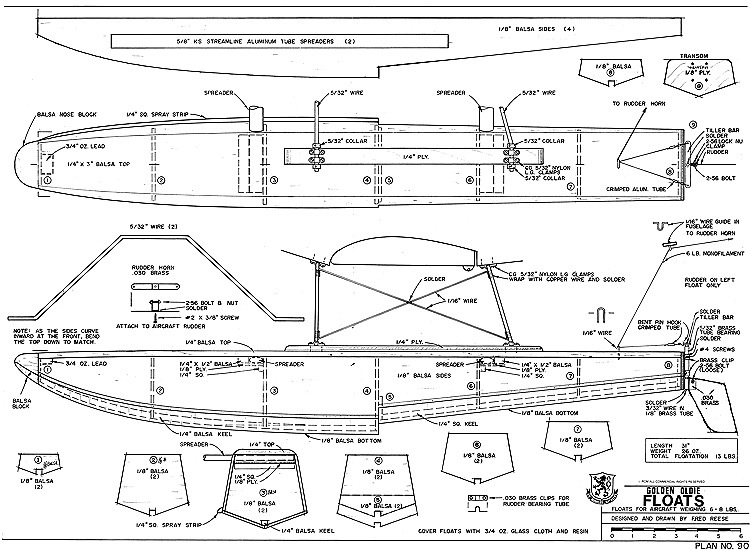 This tool allows you to calculate the cost of printing and shipping the Golden Oldie Floats plans and its building article if available. If you need to resize a plan please contact us with the ID:97972 and the desired wingspan. I will calculate a price upon request, please contact me here mentioning this PlanID: 97972 and the job you wish me to do. This plan is 322.7 KB and was shared by our member André on 13/01/2017 16:15 in the PDF Bitmap Wood Model Airplane Plans (2) category.